A strong online presence is vital to the continued success of a business. It is important that your business has an “online home” that you can direct those who want to learn more about your business to. We are here to make sure that your business is represented in a clear, concise and user-friendly way. We offer design, hosting and maintenance services for businesses of all sizes. We believe in making our processes as simple as hassle-free as possible. Once we have gotten the preliminaries taken care of (budget, initial payment, deadlines and contracts), our work begins. The first step in our process is for us to sit down (in person or virtually) and gather and/or create the content that will go on your site. This includes verbiage, images, colors and menu layout, to name a few elements. Once brainstorming has been completed, we will move forward with the design of your website. During this phase, you won’t hear as much from us as you did initially, but we are still working diligently in the background, and we are still available to you should you need anything. We will gladly host and maintain your website monthly (for a fee that is discussed and included in your contract), or we will provide tutorials to show you how to maintain your site yourself (or via your staff). YES! 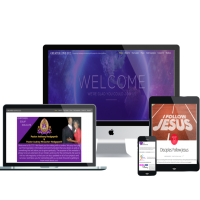 If you are in business, you need a website. 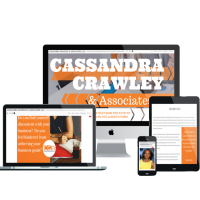 You may not need an elaborate website with lots of pages – you may only need a single page to display your services offerings. Websites ensure that your clients/customers/patrons can find you even if your location is physically closed. Websites eliminate the time you would have to spend answering frequently asked questions over the phone. Websites are a win/win situation for your business and your customers. You NEED one! We service all kinds of businesses. Restaurants, body shops, landscaping services, churches, nonprofit organizations, bloggers, freelancers, schools, eCommerce store owners, retailers – if you can dream it, we can build it! See for yourself! Greater Love is a thriving church in Rocky Mount, North Carolina. Majestē Media completed (and currently maintains) their website. This website includes custom graphics as well as plugins for online giving, video broadcasting and a blog. Click the image above to view their site (which will open in another tab). CC&A is a trailblazing consulting firm located in the DMV area. Majestē Media created (and currently maintains) their website. This website has custom graphics and a customized contact form. Click the image above to view their site (which will open in another tab). 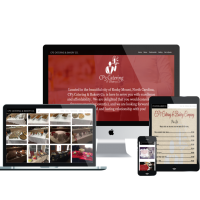 One of Eastern North Carolina’s premier catering companies, CP3 Catering & Bakery Company has a sleek and simple website that was created by Majestē Media. 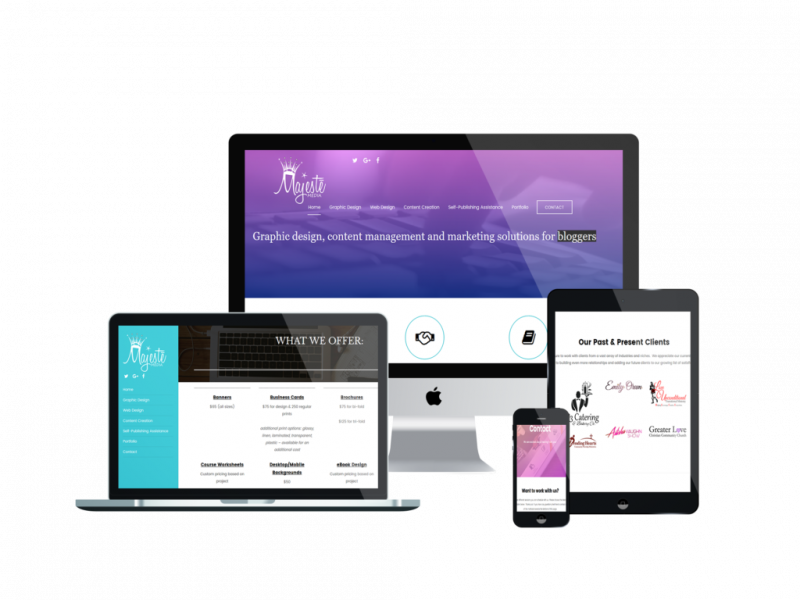 It comes complete with a logo, custom testimonial graphic, and the implementation of plugins to conveniently display their menu and contact forms. Click the image above to view their site (which will open in another tab). Since every client is different, we never want to provide blanket pricing. A lot goes into creating what you need, and we want to be able to present you with the best options for your budget and business needs. Because of that, we build all of our website packages from the ground up. We do this to avoid charging you for something you don’t need and asking you to pay for a package that doesn’t include what you really need. We provide free consultations to our potential clients to discuss their website needs, and from there, we send you a proposal that includes your custom package and pricing. When you’re ready to schedule your consultation, you may do so below!